River Star Vineyards is tucked along Estrella Road in San Miguel at the northern end of San Luis Obispo County line. Family owned and operated by Ed and Muriel Dutton, the property was a horse ranch when the Duttons purchased it in 1986. Over the years, the family planted Cabernet Sauvignon, Merlot and Zinfandel among other varietals. Currently 60 acres are planted on the 80-acre ranch. As grape farmers the Duttons sold their fruit to various local wineries and didn’t start bottling until 2001. Currently they sell 90% of the fruit and keep just 10% for wine production that totals a mere 1,500 cases annually. Walk into the rustic tasting room amidst the rural setting and you are welcomed by a family of friendly dogs in all shapes and sizes. The wines here are food friendly too. “The wines are not very big, that’s not who we are,” said Muriel. There are a dozen wines for tasting starting with the 2013 Red Rocket Chardonnay sourced from Santa Barbara County fruit followed by the crisp, bright 2013 Red Rocket Sauvignon Blanc, the only white varietal planted on a 10-acre parcel of vineyard. A 2013 lush Viognier is fragrant with pineapple and apricot notes. The red lineup includes a 2011Merlot that shows bracing acidity and firm tannins and the 2011 Zinfandel, redolent with raspberry and strawberry aromas. The 2010 Cabernet Sauvignon from the 26-acre vineyard on the ranch is bright with Bing cherries. There are a couple of lush blends with Paso’s signature varietal, the Zinfandel grape. It goes into the 2011 Affinity along with Cabernet Sauvignon and Merlot and in the 2011 Eclipse along with Syrah and Petite Sirah. River Star will begin the summer concert series on Fridays, 7 P.M. to 9 P.M., from the months of June through October. There will be food and wine for sale and live music on the intimate terrace overlooking the vineyards. 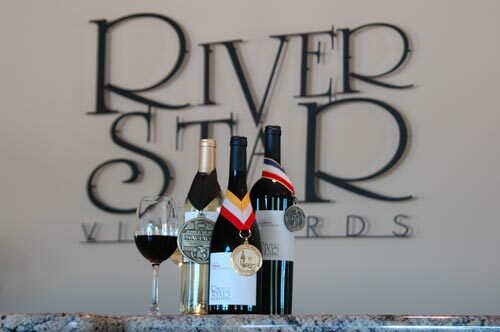 River Star Vineyards’ tasting room is located at 7450 Estrella Road in San Miguel and is open Thursday to Monday from 11 A.M. to 5 P.M. For more information visit www.riverstarvinetards.com or call (805)467-0086.